What happened last Saturday night about an hour after Shabbos was life-altering and shattering to Dr. Richie Friedman’s family, as well as a shock and astounding loss to his friends and colleagues. Dr. Friedman was a deeply honorable man, a physician with a busy schedule, but also a person who always had time to stop what he was doing to assist people in need. 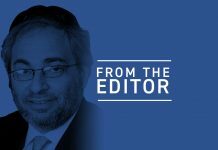 And that is why Dr. Friedman was the go-to guy for the Hatzolah organizations around New York, including here in the Five Towns, where he served as medical director. “I’m brokenhearted and devastated,” said Baruch Ber Bender, a Hatzolah volunteer who runs the Achiezer organization located in Lawrence. “Richie was the ultimate helper and the ultimate giver.” He adds that though Dr. Friedman ran a very demanding medical practice, whenever Bender reached out about medical or Hatzolah-related issues, Dr. Friedman, unlike many other busy doctors, always called back. Richie Friedman was popular and a good friend to many. Meir Krengel, a close friend of the Friedman family and also a Hatzolah volunteer, said there was really no one like him. “He was truly selfless and dedicated, always reaching out to people who required the benefit of his medical expertise and advice,” Krengel said. This past Shabbos was the same as any other for Dr. Friedman. He went to The Shtiebel in Cedarhurst for Shacharis and then later in the day went to Rabbi Glick’s shul in Lawrence for Minchah, shalosh seudos, and Ma’ariv. It was a short Shabbos, but a long rainy day, and driving conditions were challenging. Those involved in what became an instant tragedy were just going about their usual routines. Richie Friedman wanted to hear words of Torah from Rabbi Glick, and the driver of the car was on his way to pick up a family member after Shabbos. The weather was inclement, and the tragic result is now well-known. Dr. Friedman was 56 years old and leaves behind his wife, Cheryl, and eight children. Over the past few years, Dr. Friedman began to wear a shtreimel and kapote on Shabbos. Some of his friends say that he was drawn to his Bobover Chassidic roots. He lived in the Five Towns where you don’t see many shtreimels on any given Shabbos, and Richie was one of those folks who stood out because of the Chassidic garb he donned along with his trim beard. In the immediate aftermath of the accident, there was talk about the lack of sidewalks at that location, poorly lit streets, that this or that could have happened that might have averted what occurred … but we all know that it doesn’t work that way. The family has heard it many times this week and we repeat it silently to ourselves — Hashem has His ways and they are way beyond our grasp or ability to understand. Baruch Bender says that Richie was dedicated to participating in all community events, receptions, dinners, and so on. Whether it was the annual Hatzalah or Achiezer event, Richie Friedman, a consummate ba’al tzedakah and doer of chesed, always made time and was there.